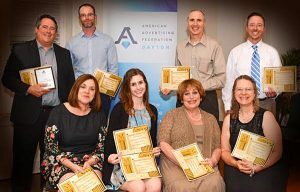 On Tuesday, May 15th, the Dayton Chapter of the American Advertising Federation recognized the region’s top advertising professionals at the 2018 Mercury Awards. The Mercury Awards recognize excellence in advertising sales and support. These awards are particularly special because winners are nominated and selected are based upon the votes of members. We’re thrilled to announce that our team at The Ohlmann Group was honored with five Mercury Awards, recognizing outstanding client service. We’d like to express our heartfelt gratitude to those who made these awards possible, including members of AAF-Dayton for their support, community partnership, and recognition of our efforts. But above all else, we’d like to thank our wonderful clients for trusting our team to bring their advertising visions to life. To all of the winners and nominees at the 2018 Mercury Awards, congratulations! We’re looking forward to another successful year in Dayton advertising.